All the while, I'm working extra hard to continue to find balance between my phone and real life 😜. 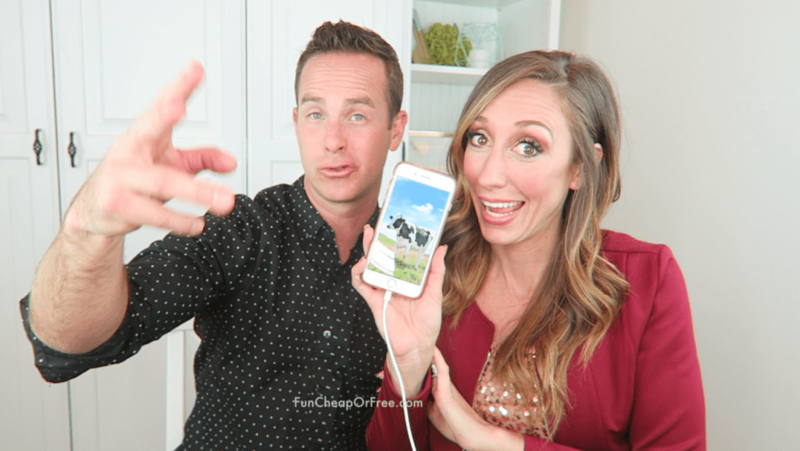 So watch all the tips we share in the video below, then keep scrolling to see a few ways that I'm working to UNPLUG more and find balance with that dang, beautiful, handheld pile of treasure. Before we get to the video, don't forget that I post new videos every Thursday on my YouTube channel so be sure to subscribe! Also, be sure to follow me on Instagram and Facebook because every Tuesday we sit down to answer your questions – L-I-V-E. It's always a party. Alright already. Let's get to the goods! I swear by my Popsocket! I have tried the rings and the loppy cases, but the Popsocket is the way to go! Nano Mount (which I talked about in my Car Hacks post) is so useful in your car. Chatbooks | Photo Books by Chatbooks, Inc.: Use the code FUNCH145 and get your first book FREE! Cafe Rio by Punchh Inc.
Audible audio books & podcasts by Audible, Inc. Heads Up! by Warner Bros.
Flipp app – amazing grocery app! Ebates – I always shop through this app to get CASH BACK on purchases! Shazam – I use this almost daily. When I hear a song playing that I love, I push SHAZAM and it tells me the song, artist, and where I can find the song. BYUTV – I love BYUTV because all the programming is family-friendly. We usually stream the shows right from the app to watch on the go. Costco app – I use it when I shop at Costco. Shows you the deals, sales, and rebates right on your phone! Sing-Along app – If you are LDS, this is my favorite app to keep my kids occupied while playing primary songs. Works great if you work in the nursery on Sundays! Uber – the only way I do transportation any more when I'm traveling! Text Replacement – stop typing the same things every day! This saves your sanity. Timer – all you need is 5, 10, or 15 minutes to power through SO MUCH. See my speed cleaning posts and videos for proof and tips! Alarms – set an alarm for EVERYTHING! But don't set the alarm for when you need to BE somewhere, set it early. (I try to follow my “rule of 3's” [I'll post more about this later] and try to set an alarm for 30 minutes early, 3 days early, and 3 weeks early. Quickly see photos and attachments from a text chain – click the “i” button in the top right hand corner of text messages and you can see all the images shared in that conversation. You're welcome. 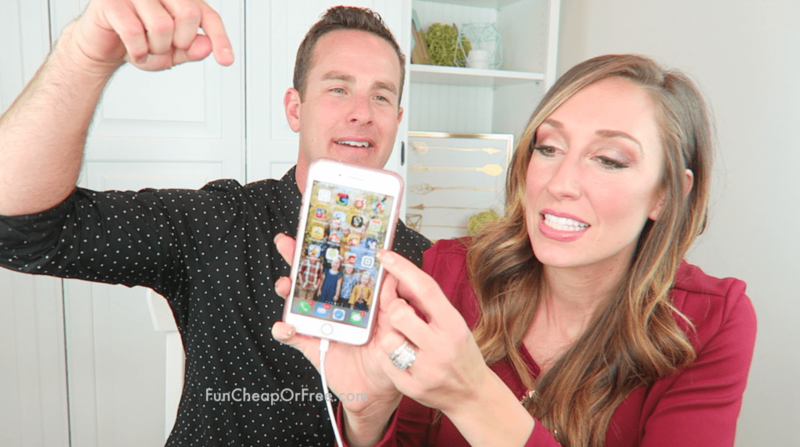 See more of my favorite iPhone hacks in my iPhone hacks for moms post! So there you have it! Hopefully those are a few tips to make your phone more productive in your life. What are your favorite apps? There were SO MANY I missed in the video, so be sure to share yours below! Awesome video! Check out the app “Things” it’s awesome to do list thing, One of my favorite features that you can make some reoccur every day, week, month, on certain dates, x number of days after the last time you do it. Loved this one! You all mentioned Audible. Have you heard of Overdrive? It’s an app/website for borrowing ebooks, audiobooks, some videos, and read along books for kids. It’s free through a lot of public libraries. It is amazing! I made a goal to read 52 books in 2017 and easily accomplished it, in large part by listening to audiobooks FOR FREE on Overdrive. They are really good looking! SANTA’s BAG!! My favorite app. It keeps track of recipients (my 6 kids, plus more) , the gifts you want to buy them, where to buy them, how much they cost, their budget, if it’s a stocking stuffer, if it’s an online order. You can Look up your list by store, by recipient, by gift. You can even check off the list if it is purchased, wrapped and given. Plus you can set a reminder of where you are hiding it (yes I’ve forgotten before). Can you tell I love this app! I use it year round! When I get an idea for a gift it goes on the list! Plus you can secure it with a passcode! Best app for list makers and gift givers. Yess!! I’ve been looking for ways to have my phone/thoughts organized! Wasn’t a huge fan of Evernote….but I use Google keep. I can still link it between me and my fiance so he can add things to the grocery and Costco list. I’m obsessed with the Chatbooks app! I made a separate insta to use for mine. These are awesome!! I’m totally going to get the sing along app! I had no idea and my kids would love it! I really loved this what a fun way to introduce apps and tools some may not know about! All these hacks have come in handy especially the Ebates app! My mother and sister always instilled being frugal in me since I was 4 years old! 30 years later I love all the tips and apps to save money especially since I’m getting my MBA to further my HR career and we all know student loans are a pain! All that and starting to plan the next step of my life, getting engaged to my boyfriend it helps to save as much as you can. Also love the Costco App especially since we have a large family and I am an auntie of 8! Thank you for all you do! Bless you! I watched this live! You guys crack me up! Love the tips! It’s always great to hear what other people use for the phones without trying a bunch of different apps until you find lone you like. I love that you included food apps, honestly those are a game changer for me! Love the Amazon app but it gets me in trouble! Oops sorry hon, I spent our mortgage payment on lots of cool stuff! 😂 I’m going to check out some of your faves! Some great apps and tips! I don’t think I want anyone looking inside my cell phone! I have been binging your YouTube but the blog posts are super helpful too. I’ll have to poo in more often! Can’t wait to try theee out! Loved this! Thanks for all the recommendations- I’m downloading Evernote as we speak and I’m sure I’ll check out more! Wowzers! Love all the tips here! You two are super fun to watch! Thanks for the Facebook Messenger hack! That has already come in handy. I was pretty proud of myself because I’m already using almost all the apps you mentioned…and for that magnet mount, my boyfriend just bought us them for Christmas and he is always raving how awesome they are literally every time we get into the truck, haha! I now have a whole list of apps I need to go try! Lol. Thanks for sharing these tips. I now own a pop socket! Thanks for sharing how you use your phone to help yourself stay organized! I need to try some of these. Love Pic Tap Go! You should get the price scanner app!! I heard about it from themelashow on YouTube but you can go and scan an item on your phone and it shows you the prices of it on different sites to let you know quickly if buying it at say Costco is the best deal for it! 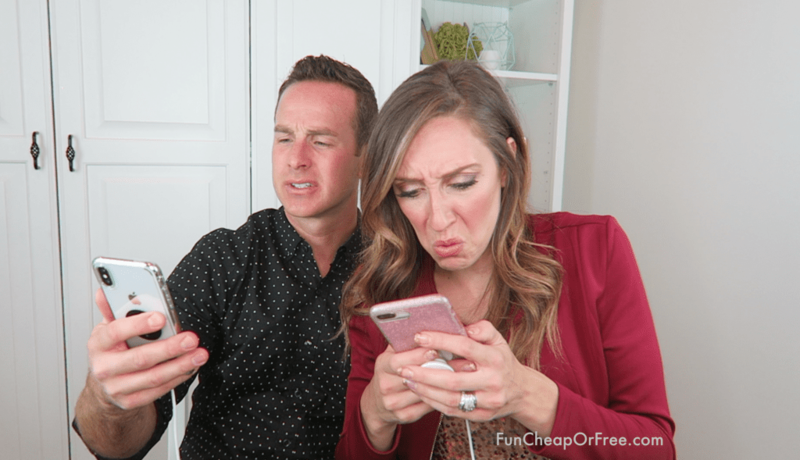 Such good apps to stay organized and connected with the hubby! Love it! Alarms all the way! Those and reminders rule my life haha. Do find Ebates to be better than other cash back apps like Ibotta? Just trying to find a couple of the best, without downloading ten thousand apps on my phone lol! This is amazing Jordan! Thank you! Great stuff!! I gotta get better at using technology! There needs to be an app that helps older people use apps!! This was such a good idea for a Q and A! Loved hearing about what apps you like and so many for deals and cash back. Also, pop socket, where have you been all my phone life?? My favorite app right now is Ellen’s Slots!! 😂😂 Such a productive app. I’ve used my timer so much more on my iPhone since I started doing the 10-15 min cleaning tip! My Apple Calendar is my life & FaceTime is how I communicate with pretty much everyone (well the ones I call on a daily). Great post with new apps for me to check out. I’m kicking myself that I didn’t know about the Costco one and that they had their sales. Walmart grocery pick up app – so much easier to stick to my budget when I order online and don’t wander the aisles. YNAB – great budgeting app where I have applied many of your ideas. Dropbox – have scanned all my important documents so they are always at my fingertips so they are always at my fingertips and safe in case something happens to our home. They include things like bills, taxes, prescriptions, birth certificates, photos, home videos, etc. FamZoo – a way that we have found to allow our kids to manage their own money and have their own “credit/debit” cards. LDS.org – love that I can keep all my gospel related stuff here. I love using the notes and tag within this app and that it will sync to all my devices. Kids in mind – great app for checking if movies are appropriate. I’ve started using your alarm system and putting names with it. So like at 2:00p, I title the alarm “15 minutes tidy”. Total game changer!! Seriously, best idea ever! Great tips! I love Ebates & so glad they made an app! I also love Chickfila & Starbucks. Love apps that earn rewards. Already downloaded a few of these. Is the Chatbooks freebie code still valid? I’ve been wanting to try them. Thanks for all the info! I 100% need to let go of my phone addiction…but this tips are cool! I started using the text replacement after I watched this. I feel like I type my email in 50 times a day. Now I have a shortcut for it!! I feel like you and Target de twins. I don’t just walk around target with a list. Target tells me what I need and I get it. You’re supposed to save me money Jordan but I keep buying your hacks!!! Haha these are great though! Great tips! I’ll be downloading some of these today! Thanks for all the info! You guys are great. Stopped using my paper calendar now use the google one. Things are so much better organized and I love the reminders. I am so glad to find that you write a blog post with your Q&A Tuesday’s! I am going through all of these apps to see what I am missing out on. Thanks for all you share! Great ideas on apps. I have a android but use several of the same apps. I’m going to check out some of the others you mentioned. It is hard to find a healthy balance for everything. I’m working on that too! Wonderful post! I’m always searching for functional, easy to use apps and often struggle with phone ‘clutter.’ How often do you reevaluate the apps on your phone? Love the cafe rio app! Thank you for the list of links! I just changed phones recently and this will load me up! Gotta get a loopy case! Hacks are the best, especially when they are about phones. Thanks for the tips for my relatively new iPhone! So many helpful tips and tricks! I set a million alarms on my phone too! Mom brain is real! If I don’t set myself reminders I forget everything! I’ve had an iPhone for years and still learned so much from this video. My goodness!! There are a few apps I didn’t know about that would totally be useful! Thank you. I love to use my phones built in note app to keep lists of everything. YW activities that come to mind, passwords (I can lock it up), book suggestions, a note page for my most shopped at stores and a list at each of what I need next time I’m there, etc. These are amazing! Thank you! You guys are amazing! I am going to download some new apps – thanks! I need to try Evernote and the Cafe Rio app! Thanks for sharing. Love reading your posts and the videos are always awesome! Great hacks and apps! Thanks! I really liked this post and video. Helps to see what useful apps and tricks others have! I LOVED this! It’s so cool that you can set reminders based on LOCATION! Never knew! I always appreciate it when people share what works for them – this gave me some great ideas! Ooooooh, good tips!! Going to check out some of these apps! I’ve wondered about chatbooks for a long time. Thanks for the tip. Of course I have the Target app, but how did I not know Costco had one!? I love the “Picniic” calendar app!! It’s a shared calendar that I find to be more user friendly than Google Cal, iCal, etc. Sometimes it feels like you need to share a calendar invitatio for date nights 😂. Evernote is great. I’ve also used Bear, which integrates with a few other apps to share notes. I love Evernote! Thanks for sharing what apps you use! This is a great list! Thanks for sharing! I’m going to try the sing along app, my kids will love it! I love hearing everyone’s favorite apps! its so fun to me! Thanks for all the great tips. I love my pop socket and have started using Day One Journaling app and the McDonald’s app as a result of watching this. Great stuff here. I’m going to have to track down a popsocket! Thanks for the recommendation! My favorite is the google calendar app! Now my husband and I can keep track with each other’s schedules. Thank you! 🙌🏻🙌🏻 Thank you!! I’m so not tech savvy so this was very helpful!! Since reading this, Evernote just eliminated my pile of kids school papers! Genius! Using your phone calendar for scheduling and your notebook as your to do book makes so much sense. I’ve tried to make written planners work for me but it never lasts long. I’m going to switch over to using just my calendar app for scheduling. Thanks for the tip!